If you have valuables or firearms that you want to secure behind a locked door, but you also feel that you might need quick access to those items, you should consider ordering the LockSAF Biometric Fingerprint Safe. Easy to program using your fingerprints, and just as easy to open, this unit will handle your security needs for your most important documents, jewelry, or other valuables. It will keep weapons out of reach of children and yet it will still allow you to get to them quickly if any threat occurs. Programming is a simple matter of following the easy instructions that come with each safe. Up to ten fingerprints can be coded, which means multiple fingers for yourself or single prints from multiple people for whom you authorize access. Opening the LockSAF Biometric Fingerprint Safe is even easier. You simply press the activation button on the safe’s control panel then place your pre-programmed finger on the reader. 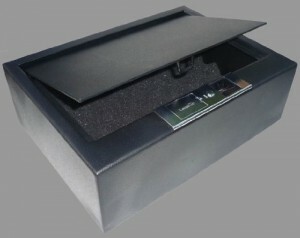 The safe will open smoothly, allowing you to access what’s inside. And it is roomy enough inside to hold quite a lot. Any items that are 12 inches in length or shorter will fit. The exterior dimensions are 13.98 inches wide by 10.24 inches deep by 4.57 inches high with the interior dimensions only slightly smaller. The interior is lined with foam to provide cushioning for your delicate valuables. There is nothing to scratch or break any of your items. Constructed of black 9-gauge heavy-duty steel, this safe will withstand attempts to force it open. Pre-drilled holes in the bottom panel of the safe make it easy for you to secure it to any flat surface so that potential thieves can’t carry it away. You can mount the safe on a closet shelf, inside a drawer, or even on the wall in an out of the way spot. The controls are powered by a 9V battery that is located beneath a cover on the front panel. In addition to the biometric fingerprint scanner, there is an emergency key hidden on the unit. This will allow you to give access to anyone you authorize but who has not had their fingerprints coded into the system. It also gives you easy access in case the battery for the scanner runs out of juice. But the 9V battery should last a long while, making this safe extremely inexpensive to operate. Users who have experimented with picking the key lock have reported that it is almost impossible to do so. They also report that the scanner is reliable, although it takes some practice in order to make sure the finger is placed correctly in the reader each time it is used. Some users have also reported that angling their fingers can result in their safes not opening, but practicing usually alleviates those types of problems. Anyone who is authorized to open the LockSAF Biometric Fingerprint Safe should spend a few minutes learning exactly how to position their fingers in order to open the safe as quickly as possible. We like to recommend that you check pricing at Amazon. They had the best price the last time that we checked. There are also plenty more user reviews over there that you can read to get more opinions. It’s a good place to start looking. How Quickly Can This Safe Be Accessed? Unauthorized fingerprints will never be accepted by the scanner, so you can rest assured that your valuables are secure inside this safe. The safe makes a beep as it recognizes the user’s fingerprint, then a clicking sound as it opens, but the sound isn’t very loud. And even if you are reaching for a weapon in the quiet of night, the safe opens so quickly that you’ll be ready in case the beep alerts an intruder. In most cases, the safe takes from two to five seconds to open as the scanner reads and approves your fingerprint. It might take a little longer if the user is frightened or stressed. But that time range is still usually faster than fumbling with a key – which would have to be located first. In an emergency, this safe offers quick, reliable access to weapons. On a normal everyday basis, it keeps other items safely and securely locked away. For anyone who keeps valuables in their home, a biometric safe is one of the best ideas for keeping those valuables secure. The LockSAF Biometric Fingerprint Safe is an excellent product that is dependable and inexpensive. It’s easy to order, install, and program, and it will offer its users years of reliable security.